The First Steps Homes Show on the 14th March was described as "an opportunity to meet the experts and providers of low-cost home ownership schemes in one place". As visitors queued on a cold, grey morning amid heavy security, they were met by Unite Housing Workers Branch protesters and supporters explaining how one of the participants, Family Mosaic, was doing the very opposite of easing homelessness when it came to its own staff - in fact they intend to make three of them homeless. The majority of visitors took the leaflets explaining why Unite was protesting. A few stopped to express their horror at what was being done by the housing association, and to offer solidarity to the affected members. 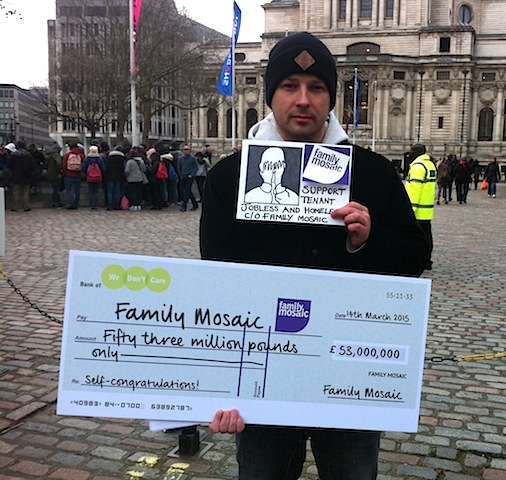 Protesters held up a mock cheque of £53,000,000 - the amount held in reserve by Family Mosaic, which claims that a small cut in funding from Hackney Council is forcing them to evict three of their own staff living in tied accommodation. The Unite Housing Workers Branch is now calling on Family Mosaic to enter serious discussions on alternatives which will ensure that the service remains in tact, and avoid evictions for the staff in question.